Dog Bite Prevention Week is a favorite of mine – every year there’s a ton of great advice floating through the interwebs. 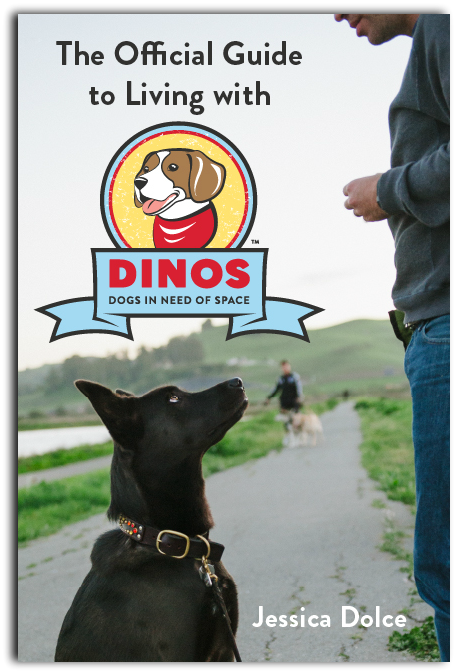 Thanks to trainers, vets, and other dog pros, we know how to prevent dog bites: understand dog body language, manage dogs properly, socialize and train them, teach kids how to safely interact with dogs, don’t chain them in your backyard or let them roam unsupervised. Got it. Here’s one more from me: Get fluent in human body language and communication. 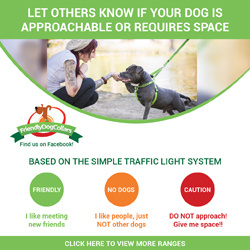 Nothing for nothing, but is anyone else stunned at how often fellow humans completely ignore or miss huge, obvious cues from other humans who are trying to communicate on behalf of their dogs? So, how come so many of us keep getting closer? I feel like the dogs would benefit if we humans got better at communicating with each other. In that spirit, here’s my contribution to Dog Bite Prevention Week 2012. Right there! Do you see it? It’s a human walking their dog. What can you tell from their body language and facial expressions? Start with the eyes. Are they darting back and forth, looking for a way to escape? Are the human’s eyebrows furrowed and pinched? You’re witnessing signs of stress. Do not ignore them. Scan their bodies and look at their hands. A human that is not comfortable being approached by a stranger will often raise one or both hands towards you. If you see body language such as an outstretched hand, palm towards you, this is a clear signal to stop! Do not continue approaching. Occasionally, humans caught by surprise might have a hard time using their words. In that case, screams, shrieks, and expletives might be used. Do not ignore these verbal warnings. Do not argue with the human. Do not tell them they are wrong and that it is ok for you to approach them because “All dogs love me” or “It’s ok, my dog is friendly“. Listen to the exact words the human uses. This is a clear warning. If you’re still not sure if you should approach, look closely at their feet. Are their feet facing towards you or have they turned to sprint in the opposite direction? When a human is running away from you, they are clearly signalling that they do not want to hang out. Do not follow them across the street. This is not a game of chase. In some cases, it can be difficult to read a human’s body language because it is so subtle. But the signs are always there, even if we don’t recognize them right away. For example: you spot a human standing off to the side of a walking path. They may look relaxed, but study them at a bit closer. Are they standing in front of their dog? Are they giving their dog treats as you pass? These are signs that the human is busy working with their dog. Tip: When someone sees you and then turns away from you, they’re just not that into meeting you. But what if the human is hiding, you ask? Should I approach them then? 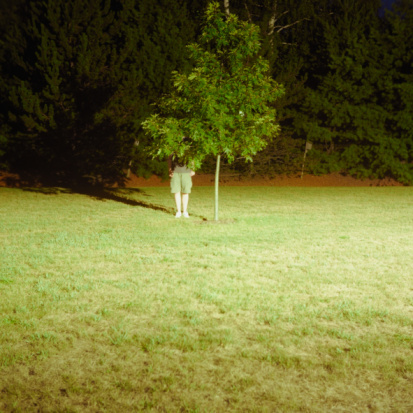 If you spot a human hiding behind a tree, car, or telephone pole. Do not make eye contact. Continue walking. Pretend that you do not see them and their dog. This human is cornered and making one last attempt to escape. If you approach you will be forcing them into a situation where they might feel trapped and bite you. Keep moving. This person is not into you. Do not flail your arms or shout. Control your dog, so that they cannot approach them. Wait for the human to respond. If they say no, do not force the situation. The human has clearly expressed a desire to be left alone. Do not ignore these signals. Give them enough space to pass and keep moving. Well, there you have it folks. The last piece of the Dog Bite Prevention puzzle: Human Body Language. If we just pay a little more attention to each other’s signals and respect each other’s space, we’ll be doing our dogs a real solid. Oh my doG!! That was soooo good. And sadly, based on fact. Can’t count how many times I’ve moved 20 feet off a trail only to have a human follow me. A couple of weeks ago, I kept darting through woods while a man with a rambunctiouos, screaming German Shepherd stayed in hot pursuit. He finally gave up after about 20 minutes of chasing us. He had to hold the GSD with two hands and had to bend his knees and dig his heels in just to keep some kind of control over the dog. Why he thought that this dog should meet my elderly, shy dog with bad hips and knees, I’ll never know (because I kept running away from him). And what’s the deal wtih waiting until the very second my back is turned to swooped down on my dogs. Seriously….why do people chase each other?! I understand it’s not always easy for humans to read dog body language. But can’t we at least read each other’s body language? Running away is a clear signal from another human! And I’m glad you guys escaped this man and his dog! It’ s so easy. People just have to open their eyes. It’s like magic. Funny, true and very sad. I go through this daily! oy….its no wonder I’m cranky! Good blog post. I take issue with all of the above and also those who come from behind to startle me and the dogs with me. What is it with people? Interesting that it doesn’t seem to make any difference what part of the country you reside! It’s everywhere! It makes me nuts that people treat service dog teams this way. I’m sorry you have to deal with such rude behavior! May I add … And stay calm … Remember the other end of the leash! Very difficult with a fear aggressive dog! So funny! And unfortunately so true. You may not think people can read dog body language, but most of it is human body language as well. And humans should be aware of their own species’ language! I have a woman who walks a male Chow in my neighborhood who has let him drag her across the street to get to where my dogs are walking for years. Even followed me when I crossed the street to avoid her dog – and almost ran into me in the process! BTW, usually while holding a phone and talking……. Yes!!!! You completely nailed the problem. Unlike dogs, humans pay almost no attention to other humans’ body language. Awesome! May I print it and hand it out to my dog training students? Is it weird to tell you I’d like to give you an award for best comment? I’m pretty sure you just named my calling in life. I hearby declare myself President of the Glaringly Obvious for the Totally Oblivious! I had a large off leash dog rush up to my small on leash DINOS a few days ago. The owner called her dog several times to no avail so I stepped between the dogs and the other owner said,”It’s okay, she’s a really good dog, she just doesn’t listen.” What?! I think it’s safe to ay the owner doesn’t even listen to herself. LOL. It turned out well, my dog was intimidated but he didn’t react aggressively as he sometimes does when that happens. My favorite is the “I’m gonna go 20 or 30 feet off the trail to give you a verbal cue that my dog is NOT comfy with yours” and still have their off-leash dog romp on over. Enter falling in a thorn bush while my dog hops over a fence to get away of the scary scary off leash dog. In all seriousness, your blog is one of the new places I direct people when they just don’t get why my dog doesn’t feel like making friends with yours right off the bat. Thank you, thank you, thank you from one DINOS mama to another. I’m starting to get that, unless people have livind with a DINOS or are very mindful of others, people just don’t comprehend that running 30 feet off a trail is unusual and a clear signal to stay back. I used to think that was SO obvious…but apparently it’s not to a lot of people. Sigh. That’s just nuts. So, I’ll keep writing until it’s clear to everyone!! Thanks for reading Lauren. It makes me happy to know the blog is helpful to you! When a dog – leashed or otherwise – is approaching my dogs and I want it to go away, I repeat “NO” over and over until the HUMAN begins to comprehend. I have had to do this with people I know to whom I have already explained in the past WHY I don’t want their dog near mine. This of course isn’t always effective depending on the circumstance, but it does work much of the time. Hahahah! LOVE THIS! I had a visual the entire time I was reading it! President of the Glaringly Obvious for the Totally Oblivious!! Priceless post and comment! Oh, that can be my new title: CEO of the GO4TO! 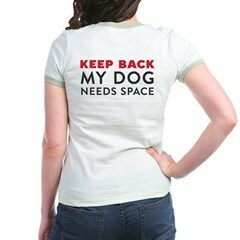 All of this is true for the people who are walking withOUT dogs but who also want some space! Lots of people out there are afraid of dogs or just don’t like ’em (hard for us to understand, I know…). It’s up to us to observe their body language and figure out, Hm, maybe this lovely pedestrian would rather not be forced to interact with my dog, even though my dog is dying to say hello and get all up in this person’s nether regions.